A bundle of live and 'office' recordings of public conference talks, keynotes and webinars. With bonus transcripts, slides, exercises and resources. There are also mp4 downloads of the talks suitable for offline listening. Do you find conferences expensive? Did you perhaps miss one my talks at a conference since 2003? Most conferences don't record the talks, so normally the only way to hear a talk is by attending the conference. That is no longer the case with my work. Since I rarely repeat a talk, most of my Keynotes and presentations are unique to the conference and the attendees, if you miss it, you miss it. In this 'course' (bundle of talks) you'll find my recent talks, with supplementary materials, slides, scripts and associated papers. Imagine each of my talks moving from a 40 minute presentation to a 2 hour workshop with references and exercises. Most of the talks have a live version and and 'office' version. The office version is usual a practice run before the main event, recorded through a local microphone and is usually better quality than the live version. Where recordings have been publicly released early you will find a reference to them in the preview 'publicly available material' lecture in the syllabus or on the webinar or conference page of this website. The bundle contains 11 conference talks and 3 webinars. Some exclusive to this bundle, all with extras. Presented as a keynote at Eurostar 2018. The live recording of the talk is a little juddery at the end, but we have an office practice session with even more content than I covered live. (Although you really need to watch the live one for the intro and the inflatable guitar). Also contains the slides, transcripts, mp3s to download. And bonus recordings of the lightning talk, lightning talk practice with an additional 5 minutes of explanation of how the content maps to cybernetics and systems theory. Presented at the Online Agile Testers Conference 2018 for Brazilian testing group. This talk as a bonus 20+ minute hands on demo illustrating the techniques and content with was not shown during the conference. Also contains the slides, a transcript, an 'office' recording, and mp3 to download. 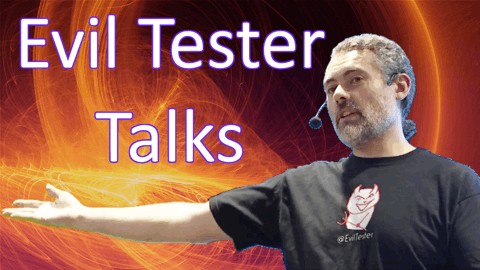 Originally presented at Eurostar Mobile Deep Dive 2015, this talk was not recorded and is only available in this bundle. We have the slides, a transcript, an 'office' recording, and a 'live' recording, with some bonus audio and video sections, and exercises. Keynote AADays 2015 Poland. This was recorded live and has been edited for the bundle, with an additional office recording, the Q&A section, and bonus transcript, exercises and resources pack. Risk Mitigation Using Exploratory and Technical Testing. This was recorded as a live stream for public listening over the phone and a local recording has been edited for the bundle, with an additional office recording, a Q&A section, bonus transcript, exercises and resources pack. Your Automated Execution Does Not Have to be Flaky. This was recorded as a live stream for public viewing. The initial content ran to 1.5 hours (so I cut down the content to 30 minutes for the webinar). The full 1.5 hours of detailed information is available in the bundle. The 30 minute webinar can be viewed online. The Eurostar recording didn't work very well so I released the main content recording that I created as a YouTube video. This, and the Q&A are available in the bundle. Also in the bundle are the slides for both versions, and audio downloads. Originally presented at March Sigist 2016, no previous recording of this talk has been released and it is only available in this bundle. Originally presented as part of the Test Automation Guid 2017 online conference. This talk goes right back to basics to examine "what can automation do for us?" Included are the video, Q&A, slides, and transcripts. Effective Software Testing For Modern Software Development. This was recorded live. Also in the bundle are the office recording, slides, audio downloads for both versions. How to Survive Agile & DevOps - a Test Management Guide. This was recorded live at National Software Testing Conference 2018 in London. Also in the bundle are slides, audio downloads, transcript and pdf case studies. I was going to create separate courses for: Automation, Technical Testing, Management, Techniques, etc. But I decided to just start uploading them into a single course. I will try to keep the list here up to date, but the easiest way to see what has been uploaded is to visit the Course and have a look - there are previews for some of the lectures and contents.. The price may increase in the future as I add more content. The fact that these were webinars or conference talks mean that they are the perfect length to watch in a lunchtime team meeting. You can then discuss the video and use the exercises to create a knowledge sharing environment and strategy session. Each of the talks can also be used as an individual to improve your process, the exercises are suitable for individual work to create an action plan for your own improvement. You can download the audio mp3's if you enjoy a podcast format. The slides and transcript are available as pdf to download for faster memory refresh and later personal study. Some of the material will have been released to the public already e.g. slides and sometimes a recording. Each talk has a preview video with 'publicly available information' so you can see what has already been released. We do add 'bonus' material, transcripts, exercises and tidy up the video and audio from any publicly released version so that the version you find inside the course is the best quality available. As an example, the video below shows the difference between the publicly available live streamed version, and the version contained in the video bundle. Last modified:November 21 2018 15:04:36.